Create a Meet the Media Art Party! Art Parties are a great way to spend time with friends and to to encounter a new medium without the difficulties of buying new art supplies. Join me for an exploration of a media that is new to you. I can provide a set of art supplies for you and your friends to try, set up the materials, demonstrate a project and guide you to a finished work in your new media. Each party is team built with you, so that it has the right balance of geeky instruction vs. art play time. Parties usually run about three hours, depending on the project or materials. Encaustics-- color-infused beeswax-- this dreamy media is almost painting, almost sculpture and works well with embedded collage elements. Limited to 10 people. Watercolor: color floating in water. Learn a few of the wonderful things that watercolors can do. Explore one of Ann's favorite art supplies: water soluble pencils and crayons. Oil paints-- Oil Paints are Ann's home ground. Learn how to use the vibrancy of oils and manage their beautiful, glossy colors. Collage and mixed media: Play around with colored card stock and follow Matisse's art making footsteps. Ann will bring card stock and templates for creating your very own Matisse-inspired decoupage. Paper cutouts are a great way to study color theory and composition if geeky is your way to play. Soft Pastels are a dreamy medium, and lovely for people just getting starting with learning to paint. Ann will bring 80 stick kits and get you started on a new addiction. Pastels are a gorgeous way to learn color harmony and immediacy in painting. Acrylic Paints: Learn how to make paint do what you want it to do. Ann will bring lots of additives and lots of paint and show you how versatile acrylic can be. It can act like watercolor, or like itself, or like oil, or in a new way invented by you. Acrylic paintings look bright and modern and have the handy quality of being dry ten minutes from now. 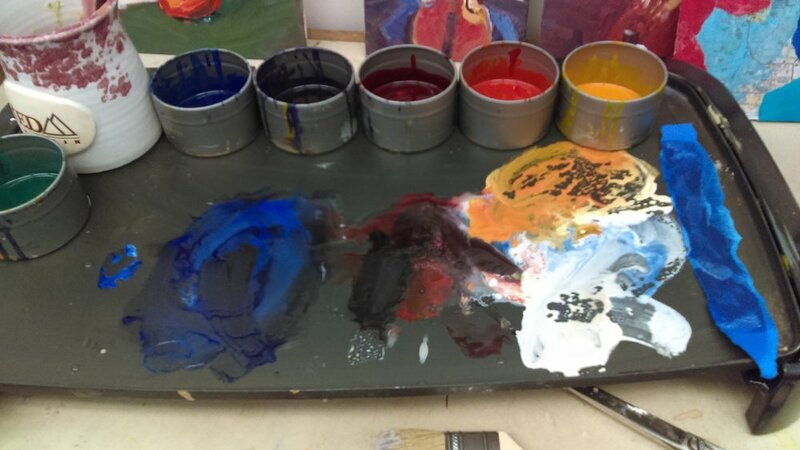 Encaustic color mixing on the the palette griddle.